The 10 Best Fly Fishing Spots in Wisconsin! Fly fishing is a great way to get outside, relax, and hone a craft. Wisconsin is home to some of the best rivers, streams, and creeks to throw a few lines in. There are over 10,000 miles of trout fishing streams each varying in character, so you won’t be hard-pressed to find a great fly fishing spot. Here are the 10 best spots in the state. Catch tons of fish on the Timber Coulee. Improvements over the past few years have added to the already deeply carved streams from run off in Wisconsin’s Driftless area. Timber Coulee is often named as one of America’s top 100 trout streams. Trout caught here have been recorded at 30 inches in length. Castle Rock Creek is one of the first streams in Wisconsin to enforce catch and release regulations. It remains one of the most popular fly fishing creeks in Wisconsin. 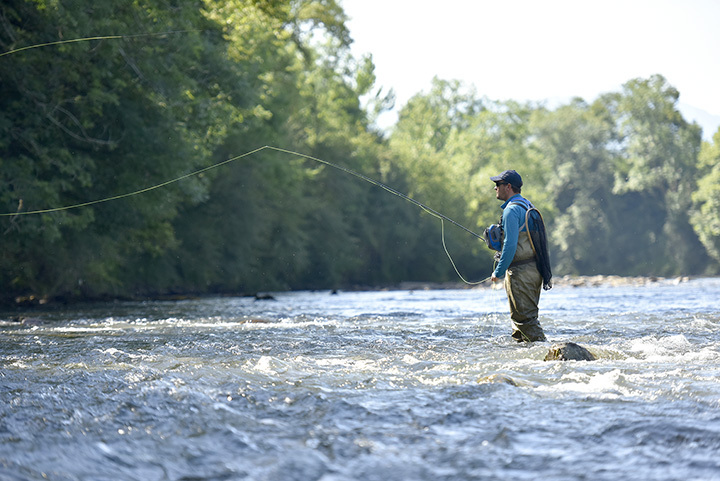 The Wolf River contains great trout fishing stretching over 60 miles in length. Fly fisherman can catch both browns and rainbow trout. Rock beds, pockets, and boulders provide a perfect habitat for trout to live in. There are large hatches along the river and tons of water insects to creating a perfect fly fishing environment. The Rush River is a 50-mile-long beautiful fly fishing area steaming off the Mississippi River. The Rush river provides a warmer environment for the trout, making it an excellent trout stream within the Wisconsin area. While the trout may not be plentiful some pretty big fish have been caught along the Rush. The West Fork of the Kickapoo River is another strength of river within Wisconsin’s Driftless area. People from all over have donated money for restorations of the riverbend. Trout from the lengths of 12-18 inches have caught and aren’t uncommon finds on the West Fork of the Kickapoo River. Separated into two parts, the Peshtigo River is broken up by a couple of flowages. The Peshtigo is known for being the most treacherous river in Wisconsin—a fair warning. It is a very popular fly fishing spot though it’s been recorded as having rough waters, so it’s hard to catch large fish. Big Green River is another popular fly fishing spot in Wisconsin. The river is a Class One trout stream. They have their own self-sustaining brown trout population. On top of plentiful fish, insects hatch year around making this a perfect space for fly fishers. Not far from Madison, Wisconsin, is the Black Earth Creek. The creek is heavily fished and very popular within Dane County. It is home to a self-sustaining population of brown trout. Not only is it great fly fishing but it is an overall beautiful place to fish surrounded by bluff and good ole’ Midwest farm land. Throughout the length of the Kinnickinnic River the cold-water springs are heavily populated by stream trout. Commonly called the Kinni for short, the river offers great water quality, and is home to a world-class wild brown and brook trout fishery. The Willow River has around 25 miles of trout baring waters and is a popular hit in both Wisconsin and Minnesota. The Upper Section has winding, warmer waters. Trout grow very big within this area. Fisherman can find both rainbows and brown trout. View more Wisconsin Fishing Holes.